Support and assistance technology is becoming progressively popular as a part of the home and neighborhood setting, this technology is particularly effective because it provides remote monitoring and care to individuals. The utilization of computerized frameworks to offer help to an individual is called ‘telecare’. There is an extensive variety of telecare systems currently available; and thus choosing the suitable system is crucial. Telecare services is the means to trigger alarms to alert the wardens, carers and site-managers to provide support to those individuals living at home or in residential enviroment. in the event of an alarm activation ie Pendant, pull cord and Smoke Detector, the resident can be assured somebody will respond via the local HUB or in person. Green Access Supplies a variety of different Peripherals inside the building premises which continuously provides a means for the residents to raise alarms.. In case of an emergency, the system will raise the alarms and alert the wardens/carers. On top of supplying different peripherals inside the building premises, Green Access supply touch screen video monitors as well. These monitors automatically generate the voice call to wardens in case of an emergency. Similarly, residents can use it to raise the alarm if necessary and it can be used for a door entry purpose, meaning one device serves multiple functionalities. Unlike other solutions in the market, our solution uses end-end IP protocol. As there are no converters and analog gateways, you can send and receive information much faster, you can handle multiple alarms at the same time and you can send as much information as you want, the only limit is your imagination. Residents inside their premises can live with complete peace of mind. They will have multiple peripherals such as fall detectors, panic buttons, smoke detectors, flood detectors, pull cords and many others. Similarly, residents will have speech units (touch screen monitors) inside their flat as well. In case of an alarm event, these peripherals will send the information to the servers. This information includes the location of the resident, their personal information, their contact details, type of alarm and the time when the alarm was activated. Immediately after the incident, carers receive the alarm along with complete information on their handset, as well as on their computer screen. Once they receive the alarm, an automatic call is generated from the resident speech unit to the warden handset. If the wardens are not available or not on duty, the system will automatically divert the calls to alarm receiving centres. These alarm receiving centers can be present next to the resident premises or anywhere in the world. Because the system is end-end IP based, we can send the information of the alarms to alarm receiving centres in the blink of an eye. The Harmony platform provides a user friendly, powerful, yet flexible reporting solution allowing managers to report on any aspect of the service and export the information you need in CSV or PDF formats. Able to send emails for events, alerts and system notifications to standard email address for response or monitoring. Access into the system is through a standard internet web browser via a PC, MAC or smart device. Remote assistance available means there is no need to be physically present on the site for support and assistance. Provide Green Access with the VPN details of the site and we will remotely monitor and support the site. IP technology enables more than one event at a time. There is no having to wait for one event to finish before the next is processed. People get the help when they need it, not when the line is free. The same platform controls the door entry system to enable a single point of configuration and management, reducing the need for separate systems and devices around the building. 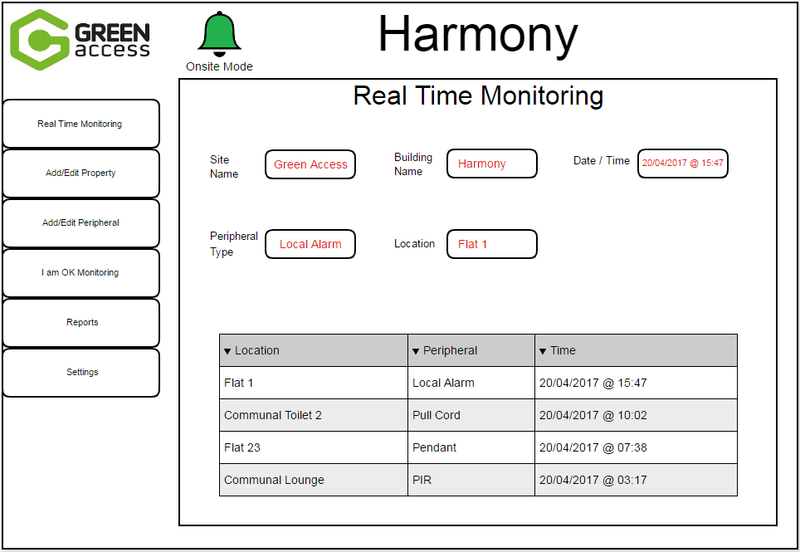 When your alerts and events are able to be handled onsite or during out of hours situations, the platform is able to route to an off site alarm receiving centre. The local warden is able to control when and how this happens. Inter-apartment calling: With just one click, the residents can communicate with other residents or to site manager as well.